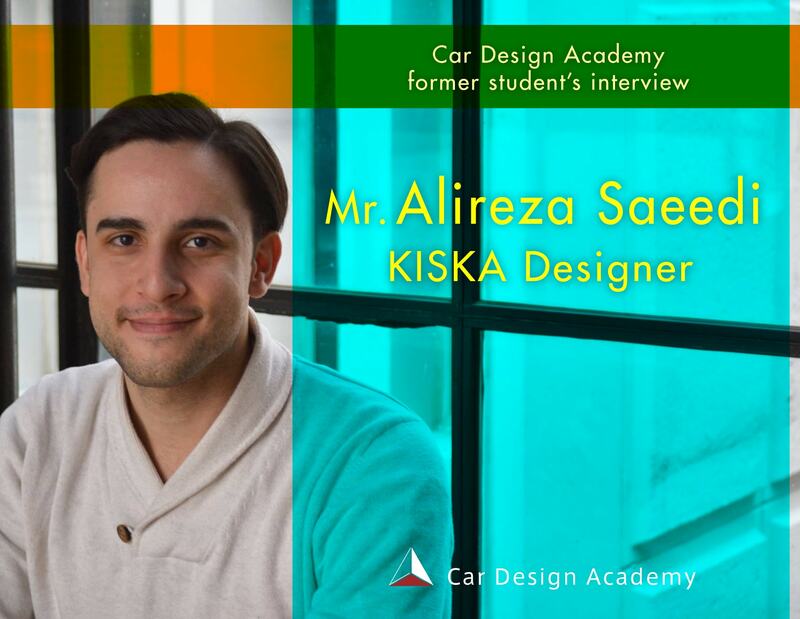 An interview with Alireza Saeedi, who has recently become Car Design Academy’s Student to get accepted into a famous design company. Why did you want to become a car designer? No real reason. I did it since I was 4 years old. I kept on sketching for fun. My mother bought me a lot of car magazines, and then I started liking it more. It was a difficult time for me to stay focused on car design while studying industrial design at school. I needed something to help keep me motivated. And other schools for car design were too expensive for me. Was there anything that made you feel hesitant in joining CDA? Not at all. The website made it easy for me to learn about the teachers and their work experience. There was no hesitation to join the online classes for me. what is the biggest benefit of studying at CDA? The biggest benefit for me was to be able to work hard at home. I kept on sketching and I got better. I got more comfortable at developing car design concepts and presenting my ideas. How did you like instructors? I mostly worked with Mr.Can. It was a pleasure being instructed by him. Although I got my feedback in a video format from him, the communication and the input that I got from him was amazing. I would get 20-30 minutes of feedback every time I submitted my work. He pushed me a lot, and that helped me to get better. I work at Kiska as a designer. It is a combination of product design and transportation design which is the ideal combination for me. What is your motivation for your job? Is to do the best I can, as far as my abilities allow me to. Currently it is a learning process, where I can learn everyday and grow as a better designer and individual. The fact that I get to work with extremely talented people inspires me to improve and get better day by day. Please share your word of wisdom with people who study or work in other field and want to become a car designer. Anything you do in life is to express yourself to the best of your ability, no matter what you do as a job. Car design just happens to be a job, but as long as you love it and find it to be a path in life where you can challenge yourself and grow, then go for it. However, there will be lots of ups and downs in design. There is and will be always somebody more talented than you, there will always be a different opinion than yours but what counts is to have drive and persistence. Persistence helps you to focus on the process, and not care about the final result. That’s where the growth happens, as you go through the process. The process however can be frustrating and seem disappointing. But as long as you are willing to be honest to yourself, to know that you are not good enough, to know that the final result of your work is not guaranteed to be amazing or good, then you will focus on the task at hand. Work hard and do it every day, and you will see improvement. But keep in mind to be conscious about the purpose of what you are doing. Don’t design just for the sake of designing. Find your reason why it makes it significant to you. For each one of us that “why” is different, but that’s OK as long as you know it and do it to the best of your ability. In this session, everyone can talk any topics related to car design with CDA instructors through a video chat. We have received many questions, ranging from course details to recruitment so far, and our instructors had answered them. Thus, this session is a great opportunity to figure out your questions and also concerns such as “I don’t know where to start for being a designer” and “I want to know about recruitment in the field” etc. Please feel free to apply this session. It’s free!